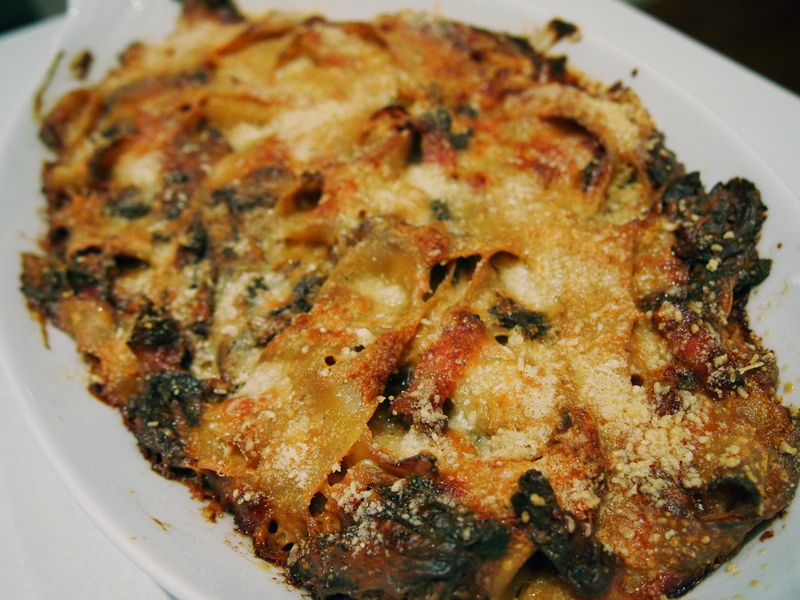 This would have to be one of the best baked pasta dishes I’ve ever made, or tasted, for that matter and I don’t say that lightly. It comes from one of my favourite chefs, Simon Hopkinson. The recipe below will feed 2-3 people and I think it tastes best when made to these quantities. 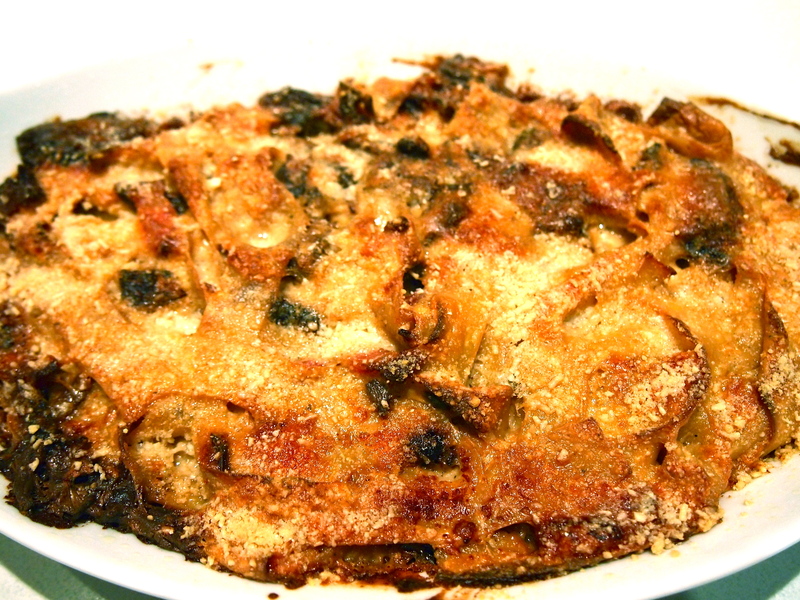 The pasta needs to lie in a shallow gratin dish so if you need to increase the amounts listed don’t be tempted to put it into a deeper dish; just use a larger shallow dish or divide it into two dishes. I wasn’t able to find any good quality pancetta; I find most of the Australian made pancetta (Italian pancetta is still not allowed to be imported into Australia) to be overly salty and I wasn’t near a good deli to pick up a better quality artisan one so I used speck instead and I must say that I found the smokey flavour worked very well with the porcini. Next time I’ll make it with pancetta as originally intended and believe me, there will be a next time! Preheat the oven to 190C. Warm the milk in a saucepan, add the porcini mushrooms, remove from the heat and soak for 10 minutes. Strain through a sieve suspended over a bowl, pressing lightly on the mushrooms with the back of ladle to extract all the milk. Heat the butter in a clean saucepan, add the flour and stir over a low heat for 2-3 minutes without colouring the roux. Pour in the porcini-flavoured milk all in one go and whisk together vigorously until smooth. Cook the sauce for a further few minutes, or until the sauce has thickened. Season lightly with salt and freshly ground black pepper and set aside. 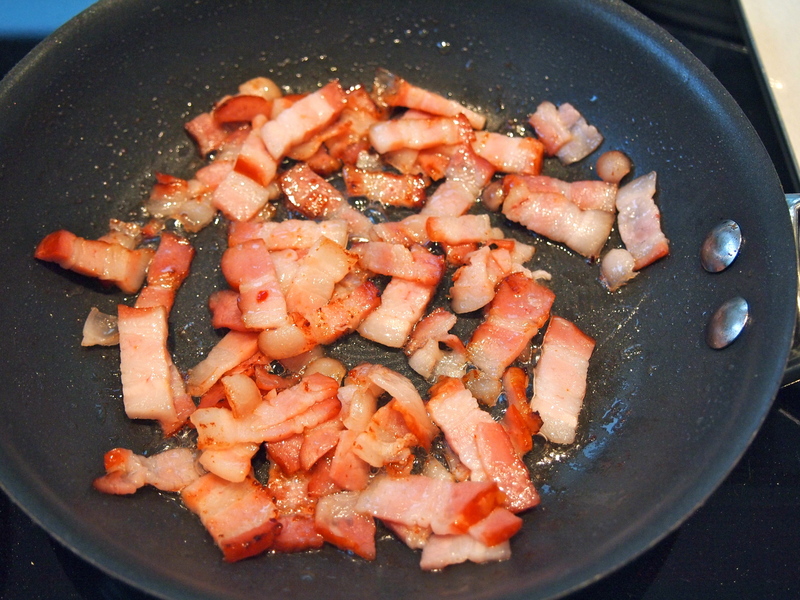 Heat a teaspoon of olive oil in a small frypan and cook the pancetta or speck for a few minutes until the fat has rendered a little and starting to crisp. Set aside. 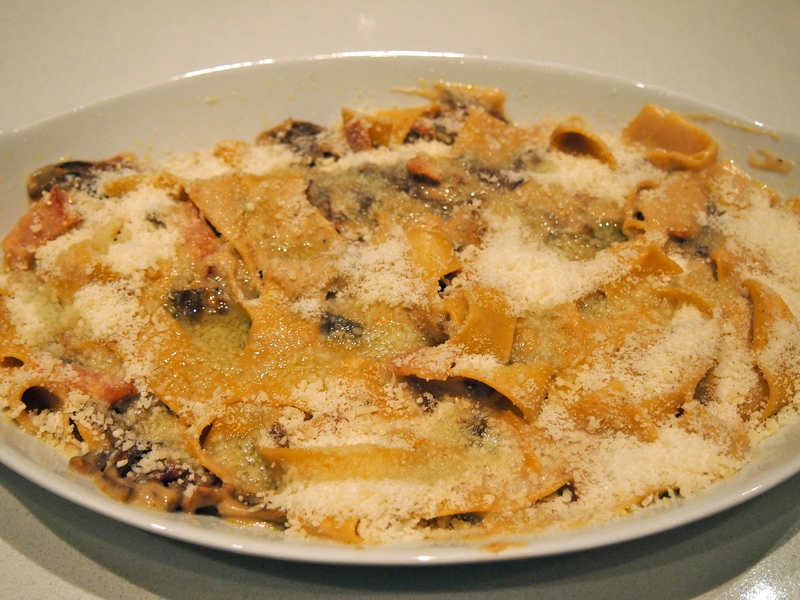 Place the pasta into a lightly buttered shallow oven-proof dish. Smooth the surface and cover with the parmesan then drizzle with a little olive oil. Bake in the oven for 30-40 minutes, or until bubbling around the edges and golden-brown.